Life Is What Happens: Charity, thy name is knitting!! I'm cheating. This is repost from a page I wrote for a knitting retreat that I attend in the Spring - Yarnover Sleepover. This year it's April 20-22 At The Fern Resort, Orillia ON. I hope you enjoy it. Many of us knit or crochet for charity. There is a wonderful feeling about being able to share not only our talents and our yarn with other people, but also our hearts. However, it's hard to find just the right charity. There are so many really deserving ones out there. In fact, I don't think that we actually reached out to any one charity, in particular. I think that "The Shoebox Project" found us. One day, as I was coming to work, I was approached by one of the architects on the main floor. He said, "You knit, don't you?" I thought. "Here it comes. Would I knit him a sweater." Well, slap my wrists. He was wondering if I could ask some of my friends, if they wouldn't mind knitting a few headbands for a charity his wife supported - The Shoebox Project. I said that I would ask around and get back to him. Call Julia Bryant. I know she has more friends, generally speaking, than myself and many of her friends either knit or crochet. Do an e-mail broadcast to yarn stores across Canada to spread the word about this wonderful project. Talk to Yoso members about The Shoebox Project. First, of course, I had to explain exactly what the charity was. The Shoebox Project is an international organization that gives gifts to woman in shelters at Christmas. In fact, there are 22 chapters in Ontario. The idea is that over the year, members collect small gifts for these boxes. 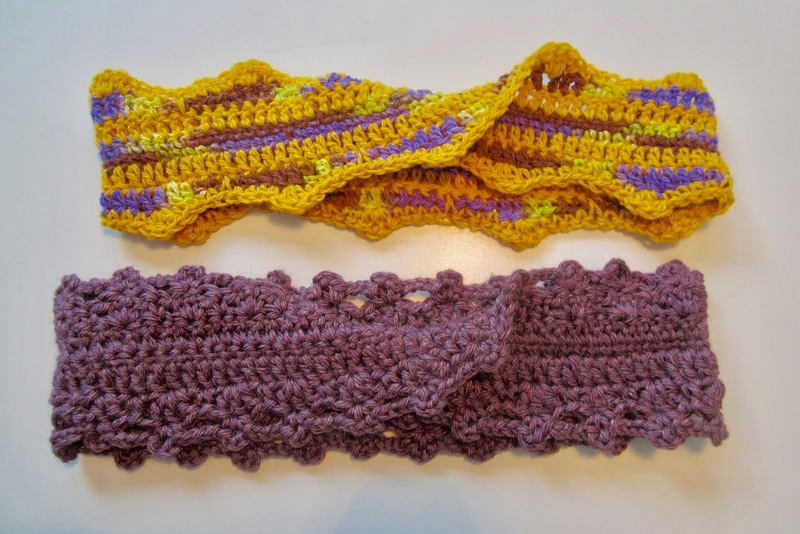 One of the most popular items, I am told, is a knitted or crocheted headband. This is how my strategy played out. 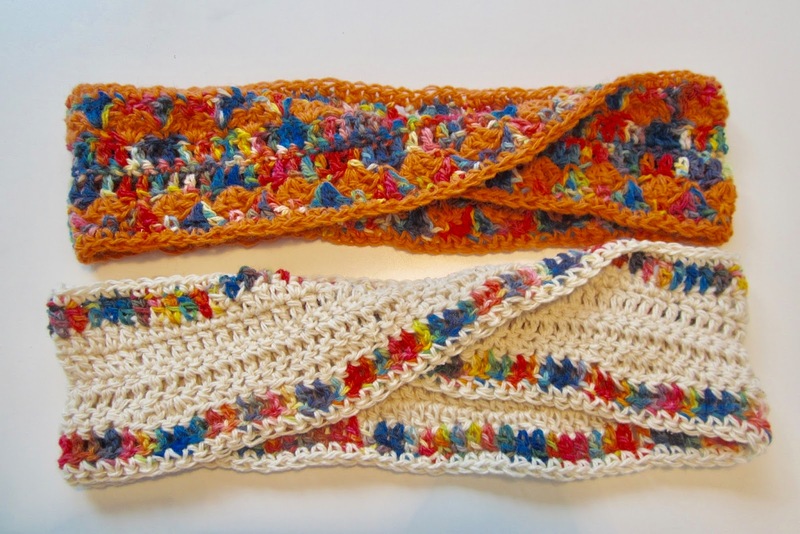 Julia contacted her friends and from August to October they created over 50 headbands. My e-mail to stores brought in several headbands from Creative Yarns, where Trish Denhoed often teaches. In fact, Trish knew of the project and was actually with a friend in California on Hallowe'en - the night a Shoebox group, there, assembled their boxes. Yoso accepted my proposal to adopt The Shoebox Project as our charity. All of us are, now, knitting or crocheting headbands and we are asking everyone who attends our weekend to consider using up some of their stash by knitting some quick and easy, or more challenging - especially if you want to try out some new stitches - headbands. Bring them to Yoso and we will see that they get into some wonderful boxes. Or contact a ShoeBox chapter in your area and see if they might like some headbands knit by you and some of your friends. Here are a few links to free patterns for headbands. Also feel free to add and/or post your own patterns in our face book group - Yarnover Sleepover All Year . 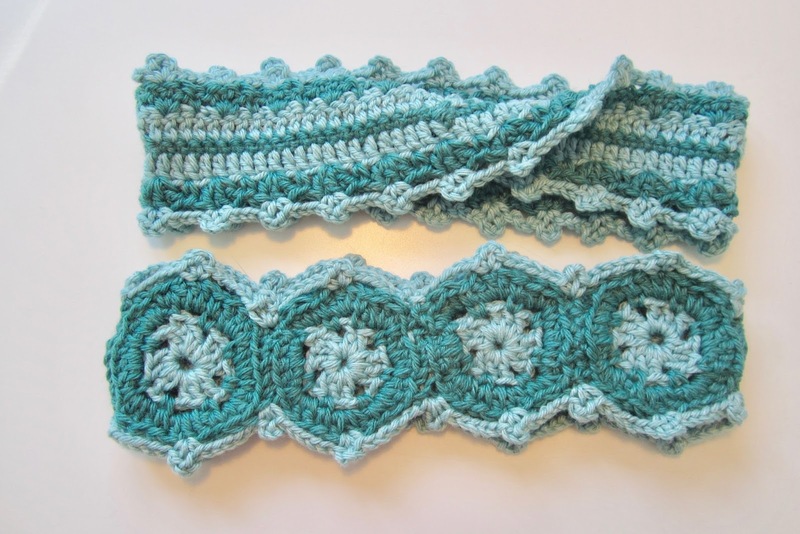 Click here for some free patterns - you will be directed to a Ravelry page. Key "free headband patterns" into the search bar and Voila! Click here for local drop of places or bring your headbands to YOSO and we will drop them off for you. Please share pictures of your headbands in our FaceBook group too. We'd love to see them!! To me a headband is like a small "hug" from afar. We've all been through some difficult times and it's wonderful to know that someone cares. The pictures? Headbands I have crochet, so far, for the project.